Zaffarano is an Associate Clinical Professor in the Hixson-Lied Small Animal Center at the Iowa State College of Veterinary Medicine. There she serves as the primary clinician for all exotic companion animal pets and is the director of the Wildlife Care Clinic. Zaffarano has more than two decades of experience in exotic companion animal medicine, having owned her own clinic in Lexington, Kentucky, for many years. While it is easy for veterinarians to feel defensive in the face of pushback from clients, it is important to keep in perspective the well-meaning reasons behind their queries. Questions about natural approaches are more likely to be a reflection of the owner’s personal values and genuine concern for the pet’s welfare than they are to be a desire to challenge the veterinarian’s recommendations. The key is to validate the owner’s concern for the pet’s safety without compromising recommendations that reflect the veterinarian’s own best interests in the pet’s health. 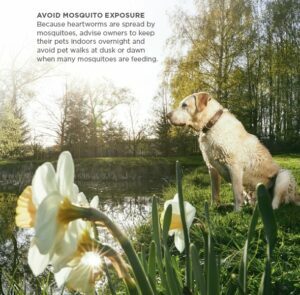 While the bottom line is that only Food and Drug Administration (FDA)-approved preventives can effectively prevent heartworms, veterinarians can recommend a number of drug-free strategies to help prevent bites from infected mosquitoes. The key is positioning the following strategies as ways to supplement the use of preventives, not replace it. Avoid mosquito exposure. 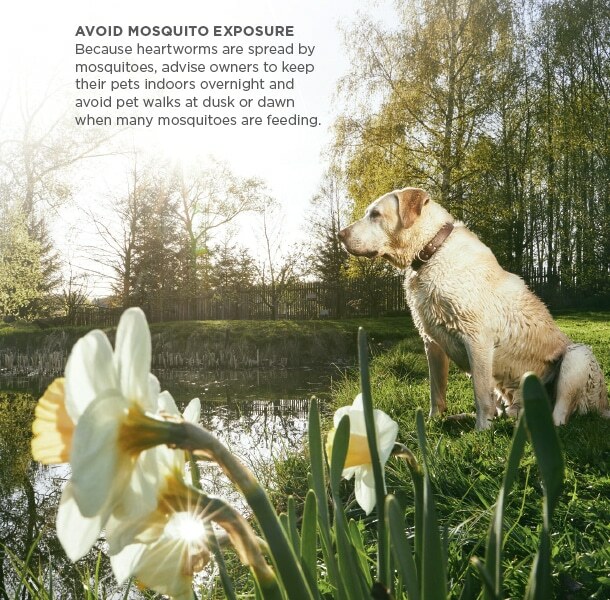 Because heartworms are spread by mosquitoes, advise owners to keep their pets indoors overnight and avoid pet walks at dusk or dawn when many mosquitoes are feeding. Eliminate standing water close to the home. Mosquitoes breed in standing water, which can be anything from a birdbath to a puddle to an empty flowerpot, pail, or wheelbarrow. While mosquitoes are capable of flying a mile or more, it is common for them to stay within a few hundred feet of where they hatch. Eliminating breeding grounds can reduce the number of mosquitoes in a pet’s home environment. Use natural mosquito repellents. Natural repellents such as Neem oil and CedarCide may help diminish the chances of pets being bitten by infected mosquitoes. Inform cat owners that Neem oil products should be used with caution in cats. Now as never before in the history of veterinary medicine, owners are seeking transparency. They want to understand what is in the products that go on or into their pets’ bodies, as well as any potential hazards associated with administering them. Veterinarians who want their clients to be compliant with administering heartworm preventives should prioritize education about the compounds contained in the products they prescribe, including safety information, and be candid about the risks versus benefits of administering the medication as recommended. Comprehensive information on product safety and potential side effects is readily available from manufacturers of heartworm preventives, so being transparent does not have to be difficult. It may be reassuring to concerned owners to know that the avermectin class of medications, to which all FDA-approved heartworm preventives belong, are naturally occurring compounds that are generated as fermentation products of a soil-dwelling bacterium. When explaining the risks and benefits of heartworm preventives, the key message to stress is that failing to give heartworm preventives—or administering “natural” preventives that are not FDA approved—can result in heartworm infection, a potentially deadly disease that requires treatment with arsenical medications in dogs whose use in cats and ferrets can be lethal. Overmedication is a common worry among pet owners. Veterinarians should be mindful of prescribing pets the protection they need without giving them more than they need, based on the individual animal’s risk for other parasites. Because location and lifestyle can increase—or decrease—those risks, formulating a responsible recommendation for parasite prevention means taking the time to ask questions and avoiding assumptions. By tailoring recommendations to individual patients, respecting clients’ desires to employ drug-free transmission-prevention strategies, and taking time to address owners’ concerns about their pets’ safety, veterinarians can inspire client trust and help increase adherence to parasite prevention programs. Holmes L. New lifestyles system data: 2016 Global Consumer Trends survey results. September 21, 2016. uel.ac.uk/-/media/olive-course/lecture-slides/new_lifestyles_system_data_2016_global_consumer_trends_survey_results.ashx. (accessed May 23, 2018).